Jennifer Mortel focuses her practice in the areas of Estate Planning, Wills & Trusts, Probate and Trust Administration. Jennifer endeavors to partner with families to secure their future goals through wills, trusts and other appropriate estate planning. She is a compassionate counselor who helps grieving family members find their way through the probate and trust administration process after the death of a loved one. Jennifer also has extensive experience negotiating top-dollar personal injury settlements, as well as handling cases through litigation. 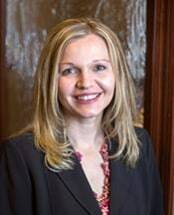 Jennifer was a partner at the law firm of Bowden Cyr Mortel, PLLC from 2009-2013 prior to founding Mortel Law, PLLC and represented clients in the areas of estate planning and personal injury. Jennifer also previously served as Assistant Vice-President and head of the Personal Trust Division at Union Bank & Trust where she was responsible for the administration of all personal trusts, including revocable and irrevocable trusts, testamentary trusts and charitable trusts, as well as probate estates. She is a 2002 honors graduate of William Mitchell College of Law and is admitted to practice law in Minnesota and Wisconsin. Jennifer also served as an Arbitrator for the American Arbitration Association and has been an Adjunct Representation Professor at William Mitchell College of Law.